I love maxi skirts and dresses. The irony is that I am 5'10" so I usually have trouble finding ones that are long enough, but when I do, I can't get enough. During the summer, I wear long dresses and sandals nearly everyday. When the weather gets cool, it can be tougher to figure out how to wear them. I really like this skirt because it's not too summery and I think it's pretty easy to wear with flats. In non-clothing related items, I had such a great weekend. My brother turned twenty-three and we celebrated by eating fajitas and margaritas, I went to an art-walk and ate Big Truck Tacos, and Eric and I got plenty of hang-out time including a leisurely Saturday brunch. Basically it was a foodie weekend, which are the best kind of weekends. How was your weekend? What a cute and easy outfit! You truly look adorable! I love a good chambray with a maxi, especially when my shirt tails are long enough that I can tie them together :) This looks like such a comfy and forgiving outfit for enjoying a food-filled weekend (agreed... the best)! I always forget that you are tall! It must be some trickery with the camera =) Your skirt looks really comfortable, and you did a great job styling it with the chambray! 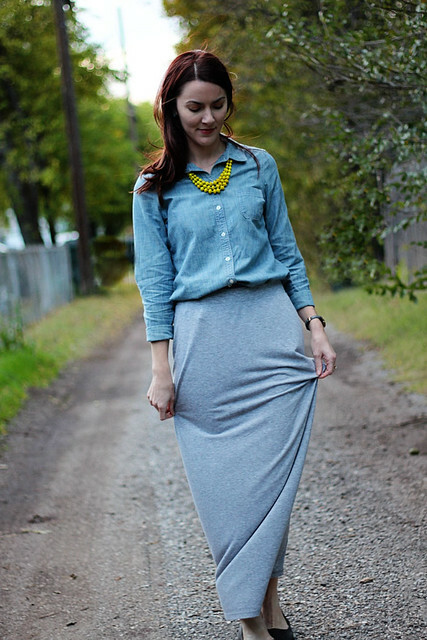 love that gray maxi - it looks so cute and comfortable...like glammed out sweats. 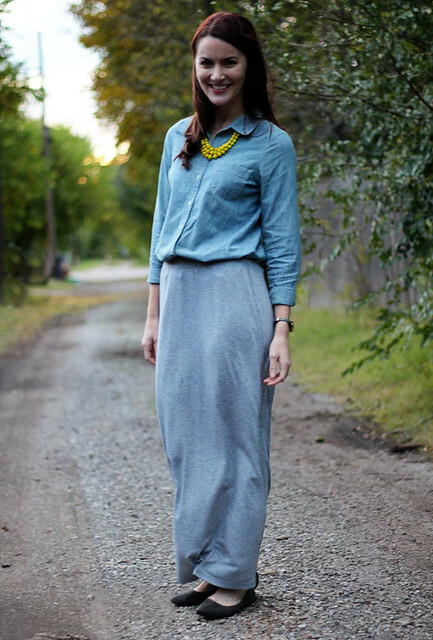 This look is really cute and a great solution for how to wear maxi skirts in winter! 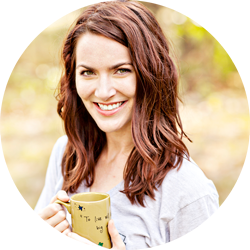 I've seen some cute looks with capes and oversized sweaters, but I like how yours is bit on the prep side with a side of sweet :) Thanks so much for stopping by our blog today! Love your style!! Loved the fact that you paired this with a maxi skirt! I love this look. I will be pairing chambray with a maxi skirt for sure now. Thank you so much for stopping by my page. New follower. 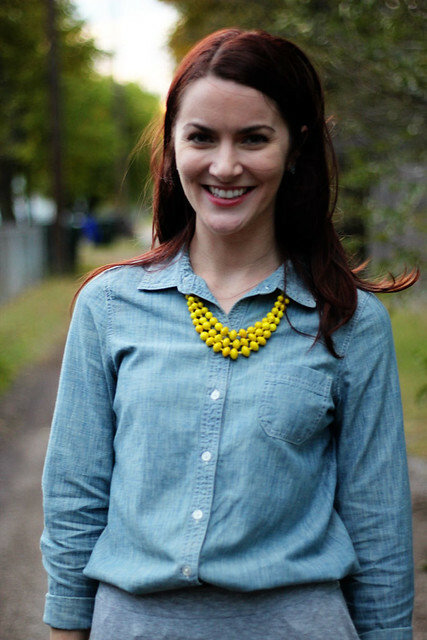 That necklace is PERFECTION with your hair, skin tone, and the light chambray. Such a great combination. Lovely look, lady! the yellow necklace is a great accent for the whole outfit. I have yellow necklace but I haven't wear them yet. You five me inspiration on how i would wear mine. <3 In any case I am inviting you to visit my blog and if ever you like 'em, we can follow and support each other. I love this niche of yours, very lady like.